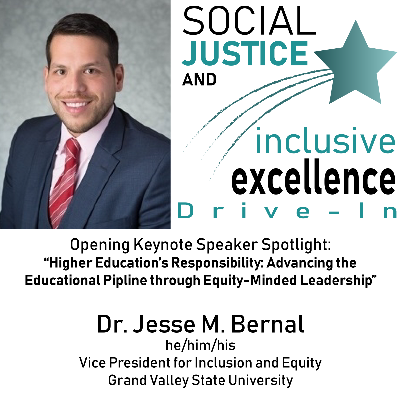 Jesse M. Bernal, Ph.D. is the second Vice President for Inclusion and Equity at Grand Valley State University. Dr. Bernal joined Grand Valley in 2015 and oversees the university’s coordinated efforts to advance diversity and campus climate. In addition, Dr. Bernal is an adjunct faculty member in the Adult and Higher Education Program in the College of Education at Grand Valley. Dr. Bernal serves on several local, state, and national organizations’ boards and committees, including Chair of the Michigan Association of State Universities Chief Diversity Office Committee, the Grand Rapids Public Museum Board of Trustees, the Arbor Circle Board of Directors, the Grandville Avenue Arts and Humanities Board of Directors, Vice Chair of the National Chief Diversity Officers in Higher Education Upper Mid-West Chapter, among others. Prior to arriving at Grand Valley, Dr. Bernal served as a senior diversity officer at Santa Clara University and at the University of California Office of the President, as well as other academic and student affairs roles in the UC system. He received his Ph.D. from UC Santa Barbara, and continues his research on education policy and law, organizational climate, and inclusive hiring.